In most organizations, the behavior of leaders prompts policies, procedures, and management styles that shape the perceptions and behavior of workers, and therefore, the organization's culture. Once a culture is entrenched, and change is desired, a systematic methodology is required to affect that cultural change. Behavior analysis provides that methodology. 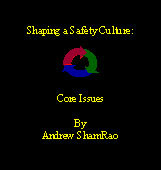 In this book, I attempt to lay the foundation for understanding the core issues related to shaping a safety culture. Divaker Ltd., 3438 N. Greeenview Ave., Chicago, IL 60657. Tel: 773-525-9685; Fax: 773-525-9684.